As seniors may quickly need care services and schedules vary from part-time to full-time to 24-hour care, ongoing career opportunities will continue in senior care as the large baby boomer generation ages. Keep up with career information, training opportunities and interview skills by using Caregiverlist’s Career Center tools. Then apply for a caregiving job. 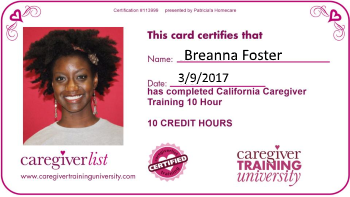 Take Caregiverlist Poll How Many Hours of Caregiver Training? Your E-mail Address and Cell Phone Voicemail: Are They Keeping You From Getting Hired? How Do You Explain A Gap In Your Employment When Applying for a Caregiving Job? You’ve Got the Caregiving Job Interview: What Do You Wear?